Diarmuid Mulkerrins and Cian Ó Conghaile with their All-Ireland medals. 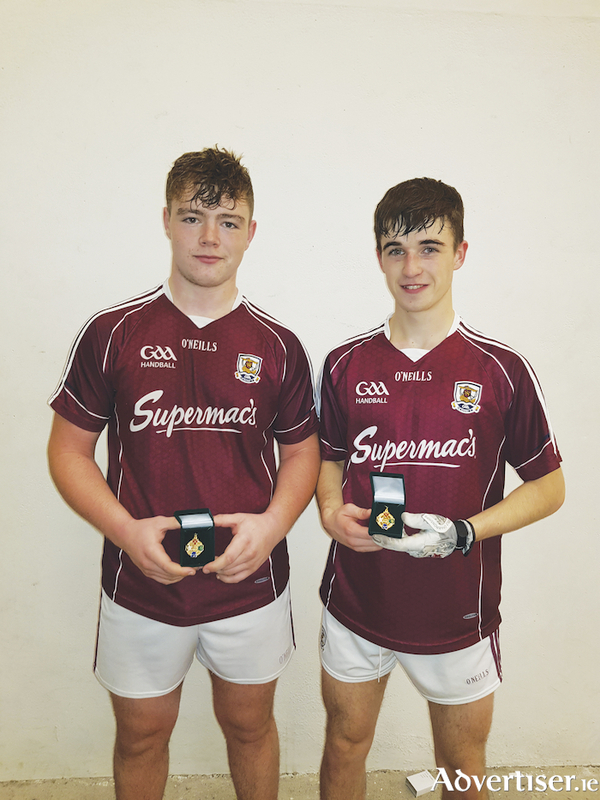 Diarmuid Mulkerrins (Moycullen ) and Cian Ó Conghaile (Michael Breathnachs ) have claimed the U21 All-Ireland Doubles final, becoming the first Galway pair to win the title in the 52-year history of the event. In Crinkle, Co Offaly, on Sunday, they beat their Kilkenny opponents 21-17, 21-12 to claim the title and another piece of handball history to the Galway annals. The path to the final was a challenging one which saw the Galway duo put to the pin of their collar to win the provincial title in a tie break against Mayo. From there they progressed to a semi-final showdown against a much fancied Tipperary pair - the fixture was a repeat of last year's minor final which the Premier county lads won by a few aces in a tiebreak. The Galway lads had to travel to Cashel a fortnight ago bidding to book a final spot. The game lived up to expectations, turning out to be a thriller. Tipperary took the first 21-10 and looked in control of matters. But Mulkerrins and O Conghaile were not going to be denied twice by the same opponents, powering on to win the second 21-14 and continued that form to win the tie break 21-14. And so on Sunday they stood on the brink of handball history. But at 8-15 down in the first and not having settled well, it seemed to be slipping from them. However some excellent serving and rally finishing kill-shots saw them level matters at 16-16. They completed the comeback, winning 21-17, and ran out convincing winners 21-12 in the second to become the first Galwegians to be crowned All-Ireland U21 champions. Willie Corcoran and Willie Shaughnessy ensured Galway completed a double of All-Ireland titles when they accounted for Wexford pair Nicky Casey and Jimmy Mythen. Corcoran lost the 60x30 All-Ireland Emerald Masters B Singles final against Wexford’s Stephen Murphy three weeks ago, but it was a different story on Sunday as the Salthill pair came from behind to seal All-Ireland glory. The interclub competition commenced on Friday with a cracking tie between Claregalway and Williamstown in the Junior B competition. Williamstown beat Claregalway by 85 points to 66 and qualified for the semi-finals against Moycullen. The other semi-final sees Inis Oirr face Annaghdown. Both semi-finals are due to take place in Salthill handball club this Sunday (4th November ).